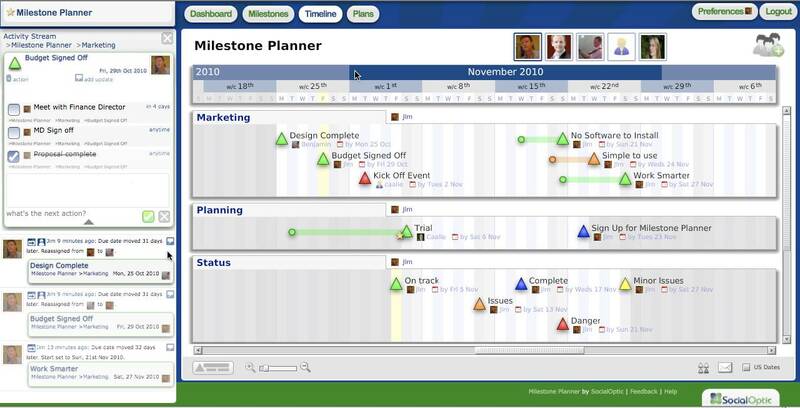 Milestone Planner's uniquely visual approach means everyone sees the big picture, instantly. Zoom in and out by date or detail, to see as much or as little as you need. The amazingly easy to use web interface means that keeping your plan up-to-date takes seconds, not hours. Just click and drag, then export professional-looking plans for use in your documents and presentations at the click of a button. It's that simple. Collaborate with your team, in real-time, wherever they are. Invite them to the plan and give them the ability to update the status of their milestones, or the whole plan, even via a mobile web browser. Changes are tracked and can easily be undone. team members can upload a profile picture to represent them on the plan, creating a visual experience that makes it clear who is doing what, by when. Create milestones to represent key deadlines in your plan, then assign them to team members, giving them the ability to add notes, update the status or adjust the date themselves. Changes are visible to everyone, right away. No more searching or out of date spreadsheets. Team members can see their milestones at a glance in the dashboard or milestones views, and receive updates via RSS or their desktop calendar. Milestone Planner turns goals into action. Traditional task lists end up as an ever-expanding wish list, but in Milestone Planner actions are created against specific milestones. See at a glance what the next action is for any milestone, and if it is started or completed. When a Milestone moves, its actions move with it. It's an incredibly powerful way to capture your commitments! Did we mention how easy it is to update your plans? Click to edit text, and the triangle to update the status of a milestone; Green, yellow, orange, red, you choose what they mean. Blue means done, and the X deletes the milestone. In the timeline view click and drag a milestone to bring its date forwards or slip it back. Create separate work streams to group milestones by project area or objective. Clicking and dragging milestones up and down enables you to easily move them between workstreams. Milestone Planner Professional Edition includes a full history of everyone's changes - a microblog of updates we call the Activity Stream, enabling it to automatically generate activity and progress reports for you. No more wasted time checking what happened and formatting it into reports. Milestone Planner instantly delivers professional-looking documents, which can even include your company's branding.